Minnesota Xtreme offers performance and competitive cheerleading teams and training for boys and girls ages 3-18+. All Star cheerleading is a multi-faceted activity that is both physically and mentally challenging. It is a team driven sport which builds personal confidence, physical fitness and health and promotes excellence and good habits in all areas of life. At Minnesota Xtreme we follow a “Perfection Before Progression” ideology. It is imperative that the key skills, drills and strength components are mastered at each level. Our performance teams are a perfect fit for your athlete who is interested in giving cheerleading a try with a lower commitment level. Performance teams do several local performances throughout the summer and fall. Each team practices once per week and will learn a 1 to 2 minute routine to music. Each member of the team is important to its success so attendance is very important. Practices start in February or March depending on the team and finish up in early November. If you have done one of our performance teams and a looking for a bigger challenge for your little cheerleader, one of our competitive teams will be just what you are looking for. Minnesota Xtreme offers teams for most all ages and abilities. We All Star Elite and Novice teams that are 11 month commitments. We also offer All Star Prep teams which we offer as a 6 month commitment. These teams offer different price points and time commitments so I know we have the perfect team for your little All Star. Our placements are for our Elite and Novice teams only. We utilize this time to evaluate and put together the most competitive teams possible based on age and ability. 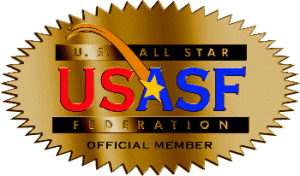 All Star teams compete based on the age and level structure set forth by the USASF, the governing body for All Star cheerleading in the United States. At Minnesota Xtreme, our teams are selected with these guidelines and based on several factors. All skills of cheerleading are evaluated including conditioning and strength, attitude and ability to work with a group, stunting, tumbling, jumps, motions and dance. An “I will” attitude will often be a deciding factor on team placement as mind set often plays the determining role in skill progression and perfection. Regardless of age or ability, everyone is places on a team at Minnesota Xtreme. Practices from May through the mid-summer months are spent developing overall strength, conditioning and all skillsets that will be performed in the routine. This is also an important time as squad bonding, trust and commitment are developed. Mid to late summer the choreography is learned for our competitive routines. We will begin working and perfecting our routines with the conditioning and skills developed. Team chemistry is forged during this time of constant repetition and the many challenges the team will face. This is our main competitive season. As we continue to improve and perfect our routine we will be competing locally, regionally and nationally for some teams. Our Tiny, Mini and Youth teams will compete primarily in the Rochester and Twin Cities area. They will finish their season with one large regional competition. Our Senior team, in addition to competing at both local and regional competitions, will also compete at one large national competition. These competitions range in size from 600-1000 teams, featuring the best All Star cheerleading programs from across the nation. For the best of the best, in late April, are “The Cheerleading Worlds” for Level 5 teams and “The Summit” for all other levels. This is an HONOR that few teams get to attend as it is by invitation only. You must receive a bid at a qualifying event to attend these competitions. 1-5 bids are typically given at these events based on overall perfection score at the competition. If we receive a bid to one of these competitions, we WILL plan on adding it to our current competition schedule. The USASF (United States All Star Federation) serves as the governing body of competitive All Star Cheerleading. The USASF sets the rules, guidelines, and policies by which we abide. Minnesota Xtreme is a member gym and proud supporter of the USASF! In 2011, Co-Owner and Coach Devo was nominated to the Next Generation of Leaders for the USASF by his peers. For more information about the USASF click HERE.